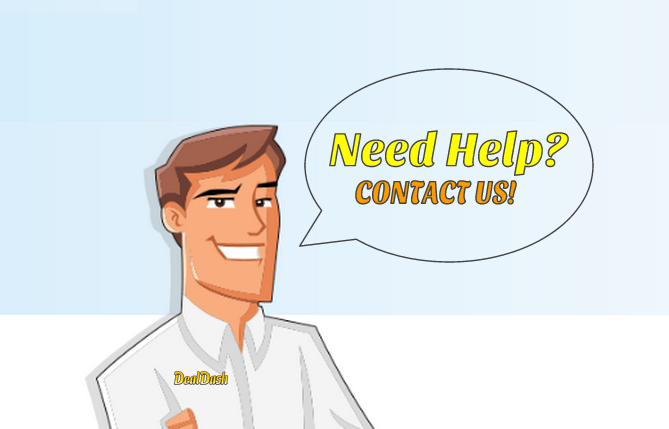 After reviews of customer service, the DealDash customer support service is the best and so helpful. They apologize and sympathize when needed, they listen, allow the customer to talk, and promise a solution to your questions and concerns. I have had great success with DealDash Customer service on my concerns. If the person you are working with doesn’t know the answer, they will find the right answer for you no matter how silly the question might be. They sent an email to tell me I had won the Best Photo of the Week contests and won a $500.00 gift card prize. Post your photos of you and your winning item. You could win a $500.00 gift card. I was given time to decide which gift card I would like to receive. After taking time to think about which one I wanted, I asked them if I could trade the gift card for Bids. I don’t remember how many bids I received. But they were very accommodating and gave me the value of the gift card in Bids. That allowed me to go on to other auctions. Some successful wins some not. But they accommodated me and I went to have fun bidding on more auctions. Best Photo of the Week winners on DealDash get a free $500 gift card of choice! With my free DealDash Bids I won a 42 inch LG flat screen TV. It now sits in my family room. I won it on a 50% off weekend. My $500.00 TV final cost was $22.49. I love this TV. I won it at a perfect time. The picture tube in my 20-year-old TV blew out a week after I won the Flat screen TV. Timing of that win couldn’t have been any better for me. Most of my bigger wins timing seem to hit at the best times for me. But not always. Being able to pay for your purchases with PayPal is a plus too. That makes paying for your Auctions wins a breeze. You don’t have to give your credit or debt card numbers if you are already a PayPal member. Enjoy the auctions and share your favorite bidding wins below! This entry was posted in Bidding Tips, Home, Review and tagged Auctions, Bidding, Deal Dash, DealDash, dealdash.com, penny auctions, reviews, Strategies on July 31, 2014 by . I have seen some advertisements as bios, the bidder has a home business and put up their web address on their bio. I suppose they were thinking they would get some additional business from bidders. Then, I have seen some bios that I would consider threatening. “Go ahead, waste your bids, I don’t give up.” And, of course you know they do. Or, they say “I am bidding til I win or BIN, you decide.” What exactly does this mean? We are all pretty much doing the same thing, we will bid til we have met our limit,we buy it now, or we win. 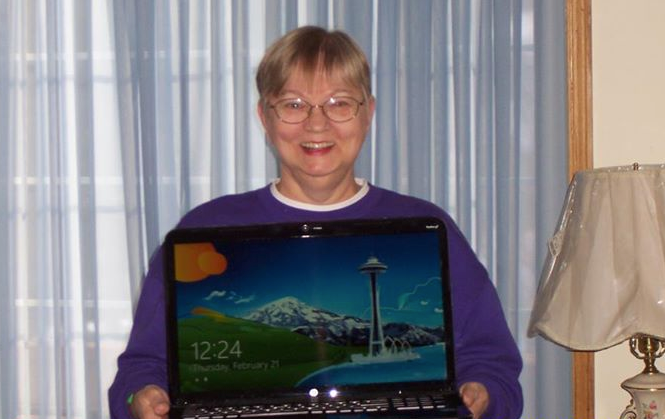 The “Grandma” bios are some of my favorites. One bidder stated, “There are some pretty mean Grandma’s out there!” I had to laugh because they were right. One in particular wins cards only from a specific store. I have never seen her bid on any other auctions and if she is bidding and is not on her maximum wins for the week, she will bid until she wins. The cost of bids or the auction win does not seem to matter. She will bid til she wins. Period. Other “grandmas” write how many grand children they have, how many great grandchildren they have, children, dogs, cats, really???? I think we should all just say something nice for these bios. Hello works for me, or just a friendly bidding tip works too. This entry was posted in Home and tagged Auctions, Bidding, Deal Dash, DealDash, dealdash.com, penny auctions, reviews, Strategies on July 30, 2014 by . I don’t know about you, but my family of 4 goes through essential everyday household items like dish detergent, laundry gel, and trash bags like crazy! Since this eats up a lot of the household budget, there’s less money left for fun, like taking my kids to see the newest movies. I like to maximize my household budget using DealDash to Win or BIN to get these essential everyday items. Everyone loves to WIN, but even if you have to end up Buying It Now it’s still not a loss, because you will get every single bid that you placed returned to you, instantly. For example, if I knew that I needed to buy the baby diapers this week I would look ahead and see if there are any diaper auctions coming up in the next day or so. If I see there is a diaper auction coming up then I would use the diaper money from the budget to buy bids. Here is an auction for Diapers which sold for 7¢! Using DealDash math is easy! I would use the household budgeted diaper money to buy a 200 bid pack, which usually costs around $32-$34 depending on which sale they are currently running. The BIN price is $49, which is pretty close to the price I would normally get them at a Brick-and-Mortar store, such as Target or Toys R Us. I would load up my Bid Buddy with the 200 bids that I bought, and hope for the best! Sometimes I don’t win and have to BIN for a fair price, but other times I WIN! Not only is it an awesome feeling, but then I also have bids leftover to bid on something fun for the family like a gift card to go to the movies, or if I had a really great WIN then a fun toy that the kids can share like a Lego set. 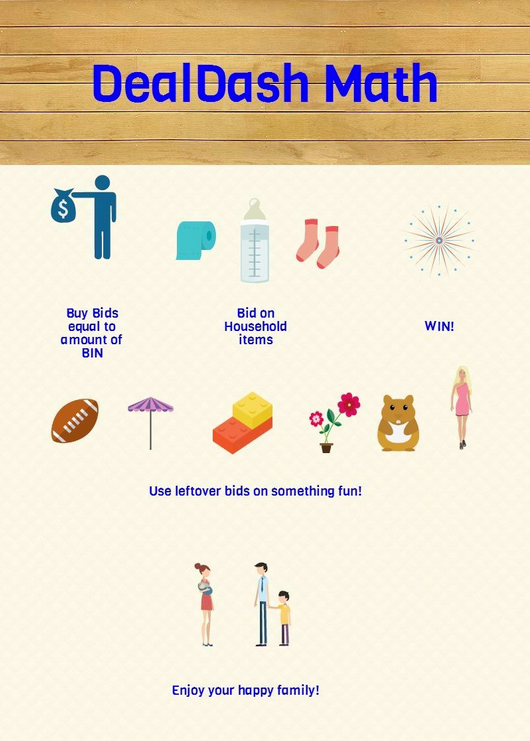 Have a great time Bidding, Winning, and BINning everyone! This entry was posted in Bidding Tips, Review, Uncategorized and tagged Auctions, Bidding, Deal Dash, DealDash, dealdash.com, penny auctions, reviews, Strategies on July 29, 2014 by . I simply love shopping on DealDash.com. 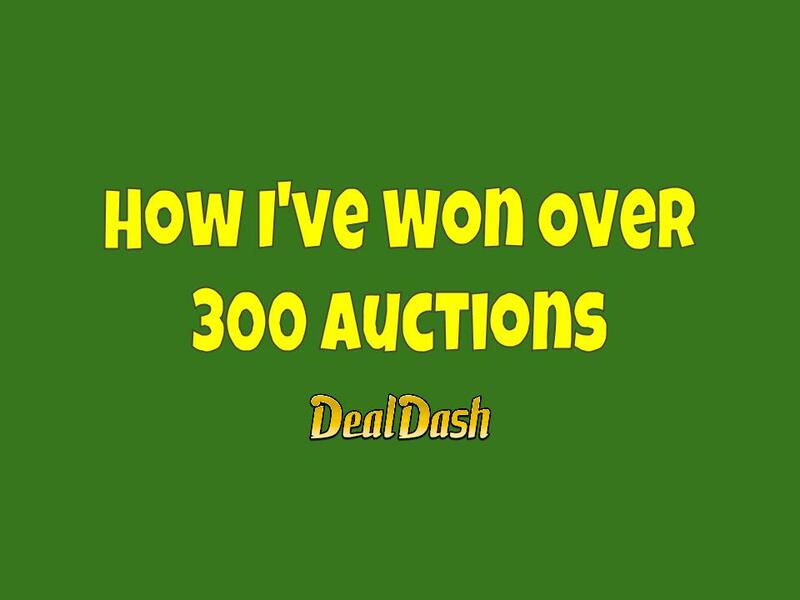 For the past two years I have won over 308 auctions and DealDash has allowed me to obtain many high quality items and gift cards I would not be able to have if it weren’t for Deal Dash. Because I am retired and on a limited budget I have to be careful and very serious about the auctions I join. I don’t bid on items to sell them, I use them for my self or to help support my animal rescue passion. In the past, I was bidding with emotions mostly for fun and the adrenaline kick when I won. I was on DealDash so much that I won my weekly and monthly limits most of the time. I went overboard and so did my bank account. No longer. I strive to be a smart bidder these days by reading tips, reviews and strategies on here www.DealDashReviewed.com every single day and utilizing the tips and bidding strategies that work well for me. Although the But-It-Now feature is awesome, I never actually begin an auction with the intention of using BIN. I am winning awesome items for a good Return On Investment. One example is a $210 Citizen Ladies Eco Drive Watch I won most recently with 108 bids and final price of $11.73. The bids were free because I participated in promotions to obtain free DealDash bids. Another is a $217 Razor E200S Electric Scooter for $ .01 & 411 bids that I collected mostly free as well. This will be a birthday present for my awesome and amazing niece! So, my bidding recommendation is to pull back and bid smart. Submit photos on Facebook and participate in whatever free promotions for free bids that you possibly can. AND …. keep reading these tips and strategies everyday! This entry was posted in Bidding Tips, Home, Review and tagged Auctions, Bidding, Deal Dash, DealDash, dealdash.com, penny auctions, reviews, Strategies on July 28, 2014 by . Hello everyone my name is Donna from Ohio, I am happily married with 3 grown sons, 2 grandsons and another grandchild on the way. I joined DealDash.com August 22nd, 2013 after seeing a commercial about DealDash that said try it now if you’re not completely satisfied get a full refund of your first bid package no questions asked, even if you win an auction you get the first bid package price refunded! So I went on the site and bought my bids, what did i have to lose? 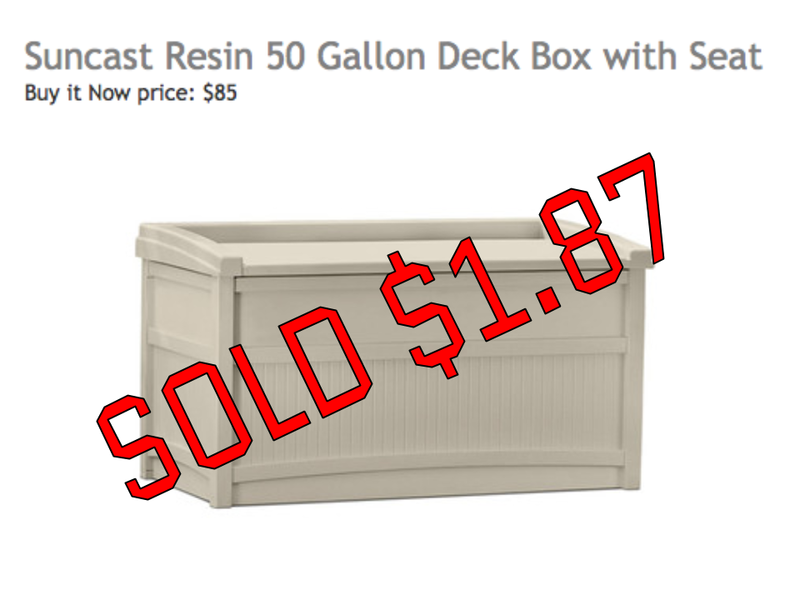 DealDash gives full money back guarantee on first purchase! The site was really easy to figure out and before long I was bidding on everything! They have alot of nice items to bid on! Of course I did not do to good the first time I tried it, I think I won a little bid pack but nothing else. So I did get a refund on my first bid package and Deal Dash credited my card for the whole bid package price just like they said! I was really surprised! The next time I tried DealDash I did a lot better. I learned about BidBuddy and how to book your bids which is a lot easier to win that way! I won bid packages and 3 more auctions. I was so excited I really enjoyed shopping on Deal Dash! I won toys for my grandsons and hair clippers to use on my sons and grandsons hair! I was hooked after that! I went on the site all the time to study the items and the way people bid. I had the site on my computer a lot. I began to love shopping DealDash and continue to love it and continue to shop with them a year later. This entry was posted in Bidding Tips, Home, Review on July 27, 2014 by .